If you live in New York, you know there's nothing more magical than a rooftop house. They're incredibly hard to spot. Some can only be seen from certain angles. Others can only be spotted if you're flying over the city in a helicopter. So when you happen see one, it's a very special occasion. A gallery of other rooftop houses can be seen here. 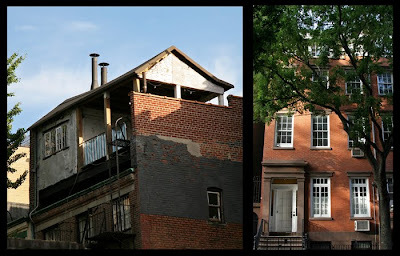 One of the featured buildings was the inspiration for Kiki Strike's rooftop digs! HEY you took some kids on a tour of the village without me?? Have you grown so callous in your old age? I want one! but I am rather terrified of heights. like ladders.I don't like ladders. but I like climbing trees, I can climb trees easily, just not ladders! that was scary!! I enetered my post then the first 2 posts appeared, magical!!! unless Kirsten is simply on fight now posting... that's probably it. or my computer is pshyco. also a possibility. Smart thing to do, I liked the gallery. Does anyone know a secure site(no bugs or extremely inappropriate material) were I can post stories I have written. I'd certainly move into one! I love interesting buildings and unusual structures. Happy Blue Monday and Winnie the Pooh day people! al fonoz: its also martin luther king jr day!! I read in a national geographic about these full on proper gardens planted on top of new york (and other city's) buildings It's really good idea, like giving back to the environment what we took away when building the city. Q:Are there any ground houses in NYC or is it just apartments? The Poe Toaster is gone this year! http://www.baltimoresun.com/entertainment/poe/bal-poe0119,0,2922653.story What happened to him/her? no, i love the Poe Toaster!!! There's something vaguely like this in my neighborhood, on top of one of the shop-buildings in my suburb. People live there, except it's not a full-on house-on-top-of-a-building. It's like a half-house, with no yard and a poor excuse for a porch. This is WAY off topic but it helps people. go to www.freerice.com to help starving people. just answer vocab/math questions and help give rice to starving people. Igor:I read the article! That's sad! I hope nothing happened to the mysterious toaster. that totally rocks! i miss living in new york..... i lived there for a year 'cause my mom was on broadway. and what's with the toaster? i be confoozed. btw, just wondering when the next book is coming out..... you left us at the BIGGEST CLIFF HANGER. this so random, but if anyone would check out my blog, it would rok. i put a book review up for kiki strike and how much i love it! Lindsey bookworm:I go on Freerice all the time. It is really interesting, and I also suggest others visit it! Ok, sojust to clarify for those who r not aware: the poe toaster is not somthing u make toast in nor does it have anything to do w/ tellytubies.. The Poe Toaster is a mysterious amn who goes to Edgar Allen Poe's grave on hisbirthday (i think) and drinks a glass of wine and brings a rose. I miss him. perhaps he had a cold. Poor Poe Toaster!! I wonder what happened!! I hope they arent hurt or sick. . . I wonder who they are. . . If they are still missing next year, we should continue the tradition!! Is anyone still up for an online irregulars group? I'm gonna try and set it up today. We have like no flat top houses here, well apartments are but actual houses have regular roofs.